1532 Saulter Rd, Homewood, AL.| MLS# 842568 | Richard Jacks UABLIVING.com 205-910-2297 | Birmingham AL Real Estate | Contact us to request more information about our Homes for Sale in the Birmingham AL area. Renovated home! Beautiful open floor plan includes the kitchen, dining room and living room. Gleaming hardwood floors throughout. Freshly painted inside and out! All new light fixtures with much recessed lighting. The kitchen is beautiful: new white Mission style cabinets and pantry, quartz counter tops, new stainless steel appliances (microwave, dishwasher and smooth cook top electric stove). Deep well sink under window overlooking back yard. Large island with breakfast bar opens to living space. Ceiling fans in all bedrooms. Two bedrooms share a hall bath featuring subway tile, tub/shower combo and vanity with granite counter top. Master suite has 2 closets, walk-in tiled shower, new granite top vanity and spacious bedroom. Long covered patio in back with entrances from master suite and living area. Laundry closet in hallway. One-car garage in basement with lots of storage space. Fenced back yard. New water line to the street. 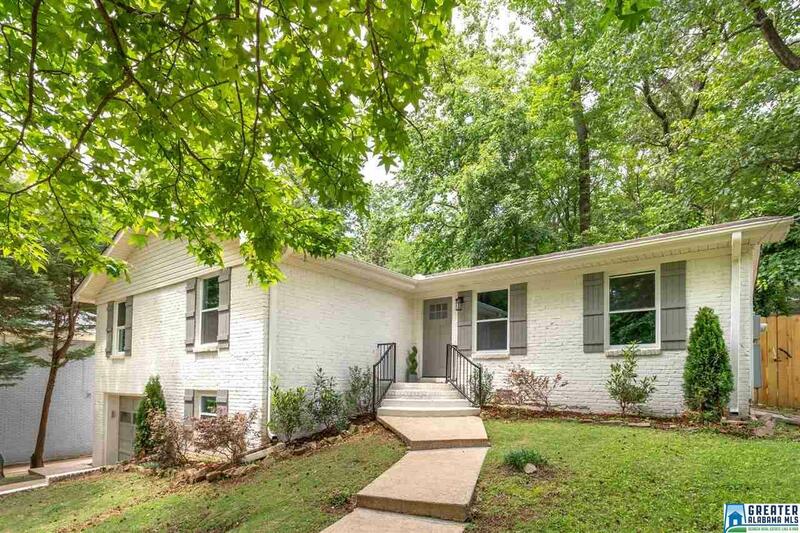 Fabulous location in Homewood.